Square Enix have this week introduced the Vindicator, an available race that is due to be playable within n-Space and Square Enix London Studios forthcoming Nintendo 3DS RPG, Heroes of Ruin. You’ll be able to find a brief background to the race alongside concept art below. Heroes of Ruin is due to release for Nintendo 3DS in early 2012. 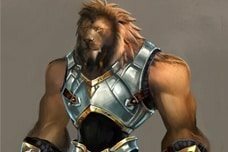 The Vindicators are an order of beast-men similar in appearance to a lion or other big cat, they are known across the lands to embody discipline, courage and great honour. They are natural heroes, leading from the front and charging into battle wielding the mightiest blades with both power and precision. They are fallible – and all debts must be repayed. Having fallen from grace within the order, the Vindicator’s penance requires him to travel the world to find a way to redeem himself from shame. Hearing tales of the ruler of Nexus being struck down by a mysterious illness, he immediately sets out to see if he can assist this situation. For the sake of the kingdom, and the sake of himself.